Omega 3 fatty acids are the beneficial component of fish oil, especially EPA and DHA. Bodybuilding recommended dosage of Fish Oil is 300-600 mg EPA and 200-400 mg DHA per day, but varies depending on your goals. Always check with a physician and follow label instructions on your particular product. Fish Oil contains the Omega 3 fatty acids EPA and DHA. EPA is short for eicosapentaenoic acid and DHA is short for docosahexaenoic acid. Good reasons to us the abbreviated names! Read about Fish Oil at Wikipedia. EPA and DHA are essential fatty acids, which means the body cannot produce these, so they are “essential” to your diet. Your body can produce, or “synthesize” most of the fats it needs from the foods you eat. there are 2 critical fatty acids, linoleic and alpha-linolenic, that cannot be synthesized and must come from diet or supplementation. Lineolic acid a key component of Omega 3 acids and alpha-linolenic acid is a component of Omega 6 fatty acids. Omega 3 can also come from ALA supplements or Alpha Lipoic acid. These essential fatty acids must be included in a healthy person’s diet, as deficiencies can cause a long list of health issues. See your doctor before using Fish Oil products. 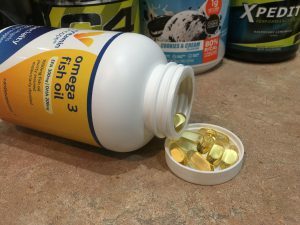 Fish Oil can be a great benefit to bodybuilders as a general health, joint and testosterone support supplement. Try it and see if you see some better results from your hard training!